As per one of my friends, Jared Jones, I will attempt to answer the question of "what defines a Major League manager?" In my job i've been staring at a computer screen for the last 2 weeks, looking at numbers, manipulating them, analyzing them, and repeating. I figured this topic would give me a reason to use my skills for awesome. Or at least interesting. I took all 16 Big League managers in the National Baseball Hall of Fame and looked at their stats. I looked at similarities and differences in their stats and compared them in the context of their managing era. My results are pretty interesting if you care anything about Bobby Cox and his legacy in terms of the history of the game. Of the 16 Hall of Fame managers 2 are below .500 in their winning percentage, 2 are above .600. The rest of them are between .500 and .600. Bobby Cox ended his illustrious managing career on monday in Atlanta with a record of 2504-2001, which is a winning percentage of .558. He ranks 4th all time in wins as a manager which sets him up nicely for a place in Cooperstown. The top 11 managers in terms of wins are in the HOF except 3...Tony LaRussa, Bobby Cox, and Joe Torre. Nice company, huh? Cox is the only manager to win 14 consecutive division titles from 1991-2005. His pitching rotation during that stretch was the object of envy for nearly every team in the game. They ran Maddux, Glavine, and Smoltz out there three out of every five days giving them a pretty good chance for success. To this day teams (i.e. the Mets) would die for 3 aces in a rotation...hell, give us just 1 healthy one to start. Honestly though, what we all remember about Bobby is his prolific ejections record. In September of this year he passed John McGraw for the all time ejection title. Unlike McGraw, however, Cox isn't known for being a hot head (as referenced in the last blog post). 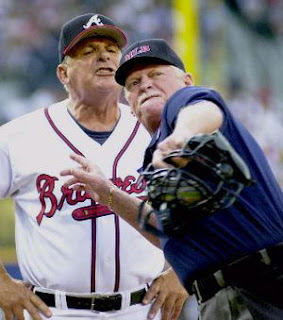 Most of his 161 ejections have been in defense of his players, which has endeared him to team after team in the Braves organization. Chipper Jones has never played for another manager in his entire career, and most of us young Atlantans have never known anyone before Bobby. What will we do now that he's gone? Go Mets? "I’m like, ‘What do I do?’ He said, ‘Go have a couple cold beers and get in the cold tub or something and relax. And then you’ll probably have to write a $500 check. Or you can do what I do, write a $10,000 one and tell them when it runs out, let me know'."